PET stands for polyethylene terephthalate, which is a plastic resin and a form of polyester. Polyethylene terephthalate is a polymer that is formed by combining two monomers; modified ethylene glycol and purified terephthalic acid. PET is a popular package material for both food and non-food products. Manufacturers use PET plastic to package commodities because of its strength, thermo-stability and transparency. 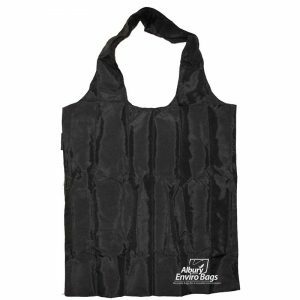 Customers choose PET because it’s inexpensive, lightweight, resealable, shatter-resistant and recyclable. What makes recycled PET eco friendly? Simply put, using recycled PET reduces waste and conserves oil and non-renewable resources. Recycled PET fabric is made from post consumer recycled plastic bottles and containers. PET’s recycling capabilities has the potential to reduce emissions by more than 15%, reduce water wastage by more than 45%, reduce solid waste by more than 35%, and reduce fossil fuel depletion by more than 25%. The use of recycled materials is a key pillar in sustaining a healthy environment and reducing the use of raw materials. What other uses does recycled PET have? Recycled PET bottles can be used for various purposes, such as school projects, and in solar water disinfection in developing nations. It can also be used as a building material in third-world countries. When collected at recycling plants, PET can be turned into fibres (which are then used to make our bags), more bottles, APET sheets, strapping tape and other miscellaneous applications. In Australia alone, more than one billion plastic water bottles are thrown away every year. Of those, only 30% are recycled – the other 700 million water bottles end up in landfill. But these bottles can be put to good use! Recycled PET is a versatile material, and the more demand there is for it, the less landfill there will be. 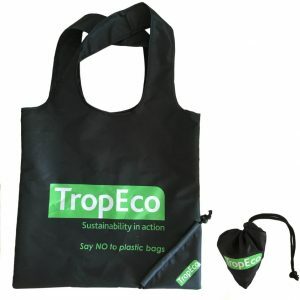 Recycled PET bags make excellent use of recycled materials. They are strong, durable and require little energy to produce. They can be screen printed, coloured and laminated, and even be blended with other fabrics such as hemp. 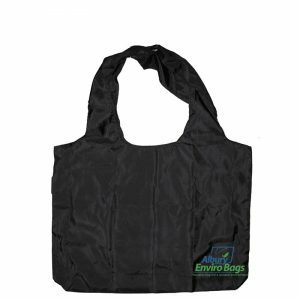 As far as reusable bags go, recycled PET bags are a great choice. 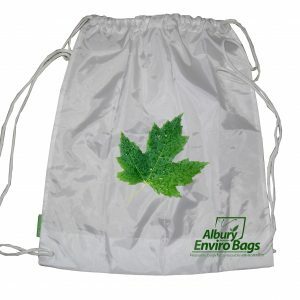 Albury Enviro Bags’ commitment to sourcing the best natural fibres and eco products has led us to create a large range of recycled PET bags in varying styles. 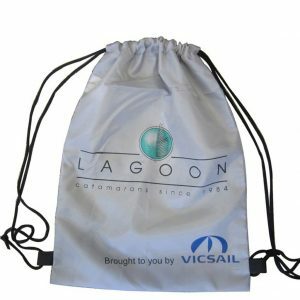 Whether you’re after a bag for carrying your groceries, need something to hold your library books, or want a drawstring backpack to transport your sportswear, you’ll find a bag to suit when you visit our PET product page today. If you any questions or need to ask about customisation, feel free to give us a call on 02 9534 6283, or fill in our online enquiry form and we’ll get back to you ASAP!